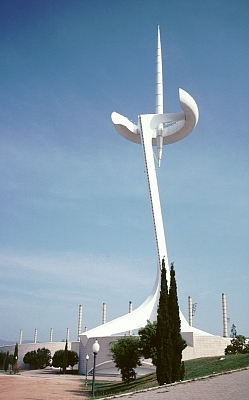 The communication tower, designed for the telecommunications company Telefonica, is just beyond the large plaza in front of Palau Sant Jordi Sports Stadium. It is 188 meters tall. (See its top in various views of the Sports Stadium.) The area of Montjuïc is also the site for the Olympic Stadium built in 1929, the Fundació Miró, and the reconstructed Barcelona Pavilion by Mies van der Rohe. See also Calatrava's Milwaukee Art Musuem (more than 60 photographs of exteriors and interiors).